ABOARD THE AmaDAGIO – Today the program is completely dedicated to wine. It’s not as though we have been lacking in opportunities to enjoy the nectar of the gods, but if anyone on board could forget that this cruise was “A Celebration of Wine,” this day will straighten them out. Upon arriving mid-morning in the small town of Tournon, our tour immediately disembarked for a Wine & Chocolate Tasting, walking through narrow cobbled lanes to the Chateau. 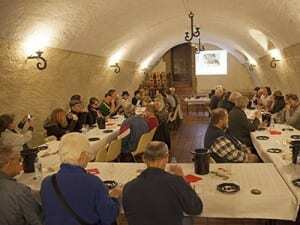 Our group sat around a long, u-shaped table in a barrel-vaulted room while Christophe, a sommelier, lectured us on the wines of the region. Alaine, a pastry chef and chocolatier, described the production of cocoa and chocolate, while we and our shipmates each stared longingly at three tempting chocolate candies on a tray before us. The first wine, a Crozes–Hermitage, was poured into our tasting glasses and we were instructed to taste the wine, take a bite if the first chocolate with a blackberry fruit filling, and then another sip of the wine. Next, a wine from Saint-Joseph, on the right bank of the Rhone, across from Crozes-Hermitage, was paired with a sumptuous chocolate caramel. Third, another wine from Saint Joseph AOC, from Natacha Chave’s Bio-dynamically farmed Aleofane Estate, was paired with a luscious chocolate cream. Our favorite may have been the chocolate caramel with the Verzier Estate wine, though we concluded perhaps our palates weren’t refined enough to really appreciate these combinations of flavors and textures. That said we had no trouble appreciating the wine and chocolate, separately. Nor did we have the slightest trouble appreciating the wines of Chapoutier Estates, across the Rhone from Tournon. But before we got there our large coach transported us along very narrow lanes into the vineyards of Hermitage, the tiny appellation limited to the slopes of a single hill rising behind the village of Tain l’Hermitage, and crowned with a little chapel. 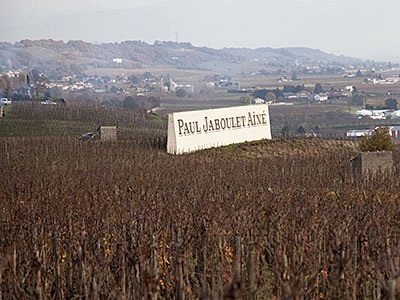 World-renowned for its complex, long-lived red wines, some Hermitage cuvees command among the highest prices. 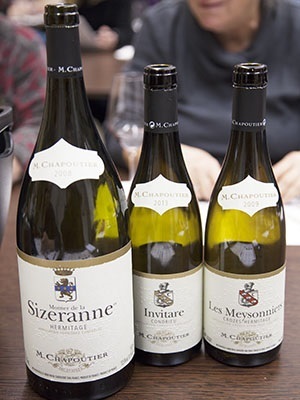 While none of the wines we tasted at Chapoutier exceeded about $65/bottle, they surpassed our expectations and distinguished themselves from the other, excellent wines of the region. We sipped a bright, fruity 2013 Condrieu, made from 100% Viognier grapes that finished with a touch of minerality, and a 2009 Crozes-Hermitage, a nicely concentrated, unoaked red with notes of red and black berries. But our favorite was—you guessed it—the 2008 Hermitage, called Sizeranne, produced from a blend of grapes picked from several of the estate’s plots on the hill. It was a powerful, elegant and well-balanced wine that should age well for another decade or more. Interestingly, all of Chapoutier’s wines are bio-dynamically farmed, and the ones we tasted featured labels in braille. If that was not enough wine for one day, back aboard AmaDagio later that afternoon, we joined in an entertaining and educational exercise put on by Wine Host Steve Ledson and local Sommelier, Gael, called “The 12 Labors of Bacchus.” A practical and knowledge exam tested each participant’s grasp of the subject. We sniffed bottles of concentrated scent, tasted a glass “blind” to judge its color, tried to locate appellations on a map of France, and tasted and compared two wines of the same grape variety to try and ascertain which was French; which California. We managed to score 13 points on this “exam” while the winner scored a near-perfect 21. Oh, well. Then of course we enjoyed a nice glass of wine offered by our waiter at dinner. We didn’t need to be reminded–It’s a wine cruise! It’s Cyber Monday! Here’s what the cruise lines are offering!